ZAUM: BEYOND THE MIND began in 2010 as a duo work between two composer-­‐performers. The development of the work was a process that can be best described as co-­‐composition. In 2012, we were joined by Rees Archibald to produce a film version of part of the work – Mitslalim. 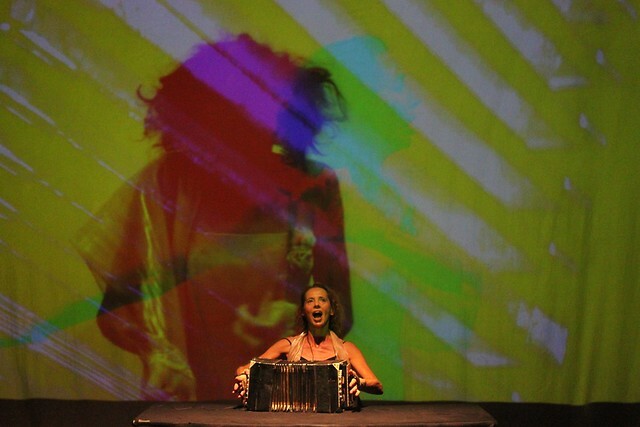 The collaboration extended to include Rees’ presence as co-­‐performer, and the use of interactive visual material that enters into dialogue with events onstage. A work of sound theatre emerging from a collaboration between two composer-­‐performers, a visual/sonic artist and a director; it comprises voice, bandoneon and interactive sound/images. Coined by Russian Futurist poet Chlebnikov, zaum means beyond mind and describes experiments in sound symbolism and linguistic creation, stemming from the early 1900s. character from the world of zaum. She (the character) stems from the early 1900s. They (the men) are part of the 21st century. What happens in this confrontation between the voice, the instrument and digital technology? Between the technician, the machine and the performer-­‐body? What if technology assumes the role of the performer and enters into a different dialogue with its human counterpart? ZAUM: BEYOND THE MIND explores a journey from conflict to resolution in this relationship, deliberately exposing us to the inner workings of its components. Multiple identities and the blurring of borderlines between the real and the virtual transform each protagonist into a curious blend of body-­‐instrument-­‐machine. The chaotic, nonsensical world of sound poetry encounters the digital – the two converging into a new, highly complex medium that goes beyond former limitations, as the title suggests. Rees Archibald worked as a professional saxophonist in Sydney, Australia, before moving to Japan to study Zen bamboo flute in 1996. He is interested in investigating relationships between breath, body and conscious states. His current work brings together a mix of devised physical movement, sonic arts, visual media and meditation. Born in Israel, Oded Ben-­‐Tal is a London-­‐based composer working at the inter-­‐section of music, technology, and cognition. He studied music in Jerusalem before completing a doctorate at Stanford University (under Jonathan Harvey and Brian Ferneyhough). Since 2007, he has been working on interactive audio projects. Caroline Wilkins comes from a background of new music performance, composition and theatre, and has worked extensively on collaborative productions involving these. Previous to studying new music theatre composition with Mauricio Kagel, she received training in both music performance and LeCoq theatre. Her particular interest lies in inter-­‐medial sound theatre. Joe Austin is a director working in both theatre and opera disciplines. Previous opera productions include: Wagner’s Siegfried (Opera North), Britten’s Albert Herring (Surrey Opera), Janacek’s The Cunning Little Vixen, Kodály’s Háry János, and Handel’s Orlando (Ryedale Festival), and Britten’s The Prodigal Son (Grimeborn Festival, Ryedale Festival). Joe directed Vivienne earlier in this year’s Tête à Tête: The Opera Festival.